Aluminum bar grating is an ideal choice when a lightweight, corrosion resistant material is desired. Aluminum grating can be used for a variety of industrial applications, due its versatile and durable properties. Direct Metals offers many options for aluminum bar grating, such as: rectangular bar, flush top, riveted, plank and I-bar aluminum bar grating products. One of the most common methods of manufacturing aluminum grating is through a swaging process. Swaged aluminum bar grating is defined by the NAAMM Metal Bar Grating Manual as “Grating in which the cross bars are mechanically locked to the bearing bars at their intersections by deforming or swaging the metal.” Direct Metals uses the most modern swaging technology available to provide attached intersections. A mechanically attached joint will give your aluminum grating a long-lasting life under normal service conditions. Another common type of aluminum grating is press lock grating. This type of aluminum grating has bars that are assembled together mechanically. The bars of this aluminum grating are locked into place by a hydraulic pressing process. Direct Metals offers many options for aluminum grating, such as swaged or press locked grating. 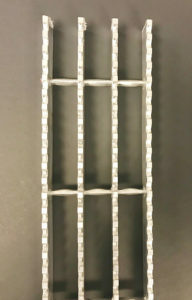 Fabrication processes are available for these aluminum grating options. Some of these processing capabilities include slitting, spot welding, shearing, cutouts, cutting, banding, notching, toe plates, and weldments. Bearing bar spacing of 1-3/16", 15/16", 11/16" and 7/16" c.c. with cross bar spacing of 4" or 2"
Bearing bar sizes range from 1" x 3/16" through 2-1/2" x 3/16" in 1/4" increments and bearing bar spacing of 1-3/16", 15/16", 11/16" and 7/16" c.c. with cross bar spacing of 4" or 2"